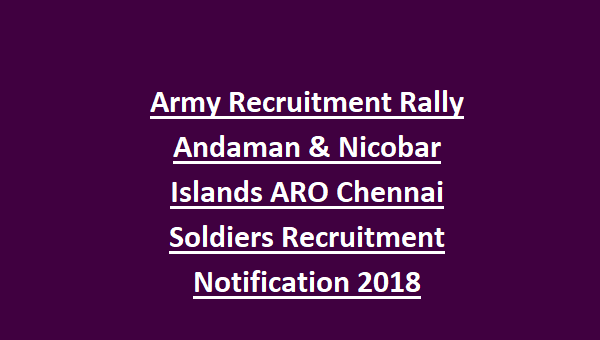 Army Recruitment Rally Andaman & Nicobar Islands ARO Chennai Soldiers Recruitment 2018: Army Recruiting Officer, Chennai released an official notification inviting young & energetic individuals from all district of Andaman & Nicobar Gp of Islands to recruit at the Soldiers post under categories namely General Duty, Technical, Aviation & Ammunition Examiner and Tradesman. 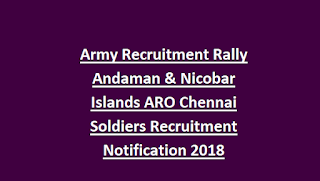 Candidates applying for Soldier Jobs under General Duty must not exceed the upper age of 21 years, and for rest of the posts applicant must be below 23 years as reckoned on 01-09-2018. Soldier General Duty: Passed 10th class with at least 45% marks as aggregate or 12th class with aggregate equal to 33% marks. Soldier Tradesman: Passed 10th class/ITI Diploma in the concerned trade. Candidates interested to serve Indian Army as Soldiers must fill the online application form through the official website http://www.joinindianarmy.nic.in/ before the due date i.e. 5th November 2018.